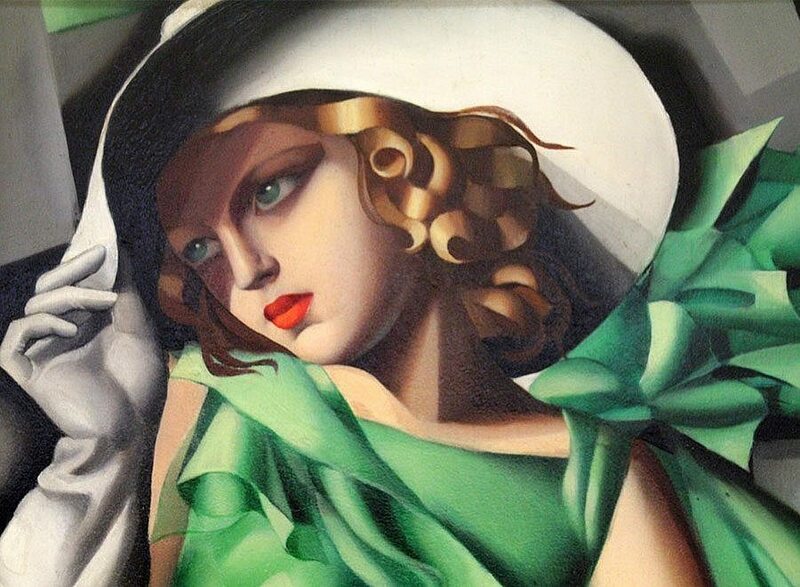 Tamara de Lempicka was a highly fashionable Polish Art Deco painter who established herself in the field through her bold, clean style and empowering content. Employing striking contrast, straight lines, and bright hues, Lempicka distinguished herself both in style and in substance. Through this conjunction between form and content, she managed to empower herself and women in general, a rather radical artistic feat at the time. She was also a product of her age, the commercialized look of her Art Deco style stemming undeniably from the cosmopolitan edge of Paris in the Roaring Twenties. Young Lady with Gloves (pictured above), one of her most iconic pieces, fleshes out a cool but sensual, elegant but self-assured young woman in sharp, clean lines. Here, Lempicka’s garçonne (essentially French for flapper) stands confidently in a glossy and flowy green dress, holding her hat presumably to keep it from drifting off in the wind. Time and time again, Lempicka manages to reconcile in her paintings what femininity had been struggling to fuse: soft, elegant beauty and a fierce sense of independence. Every part of this young woman, even her hair, seems to be a silky fabric of sorts, and yet her cool expression and stark sensuality offset this supposed malleability. As clear-cut as the lines here are, it is difficult to claim that they are either sharp or soft. And that is exactly what is so revolutionary about Lempicka’s art. It almost effortlessly bridges the abyss between false dichotomies, whether it be strength and traditional femininity, sharpness and softness, beauty and confidence, or coolness and sensuality. Perhaps the most striking part of this piece is the apparent lack of emotion on the subject’s face. Sporting a look of almost disturbingly cool beauty, the woman forms a formidable presence in the absence of emotion—a classic femme fatale of the art world, painted lips and all. With the femme fatale archetype in mind, this piece lends itself to larger questions about the empowerment of women through art, literature, and all forms of media: is it necessary to suppress ones emotionality to reverse preconceived notions about women – for example that women are ruled by their emotions? Do you think there’s a way to go above and beyond what Lempicka did, and reconcile the idea that women can be both independent and have a powerful emotional life? Isn’t the very idea of individual strength rooted in being able to experience and manage strong emotions? Could you also say, that perhaps the woman is not formidable, but aloof? This woman may be simply playing the role that society expects her to, by sitting still, silent, looking beautiful. Could her silence instead speak volumes not about her revolutionary feminism, but her complacency or silent rage? I love how the hair is in the same motion as the dress. The shading that demonstrates where the sun is coming from is lovely and done perfectly. The lady’s aura of nonchalance is very empowering, whether she is passively playing her role in society or knowingly being this mysteriously captivating figure. The full painting (uncropped) is amazing, as well; I love how Lempicka illustrated the garçonne’s dress.